Market was inspiring, educational, and incredibly fun! And it was wonderful to see everyone who made it to our Steelyard Insider Events. This was our co-hosted series of intimate meetups at some of our favorite partner showrooms. 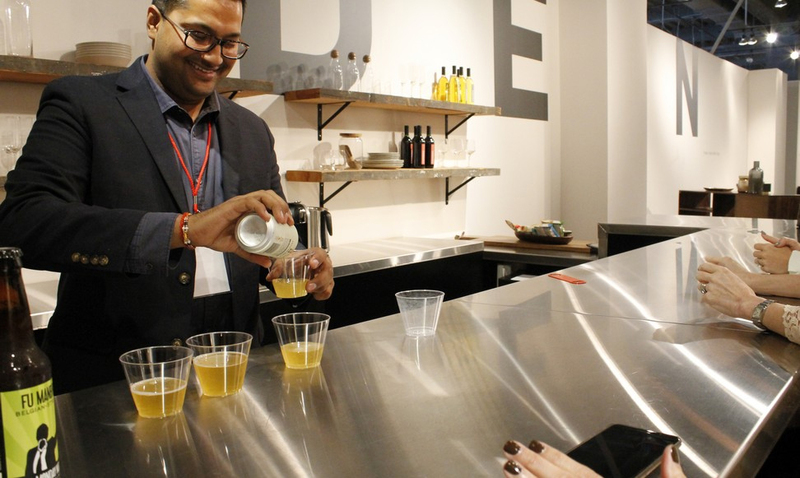 THE STEELYARD DESIGNER'S LOUNGE officially opened on Friday and welcomed designers, press, and attendees of the Fashion Snoops’ Culture to Product seminar for happy hour. In the seminar, the always-fascinating Jaye Anna Mize outlined 2 distinct Trend Stories that are emerging for 2018, Aura and English Rose. The cultural origins driving these stories will continue to play out in the coming seasons. Gathering to learn while greeting old friends and new, it was a warm and festive way to begin Fall Market! TA AFTER DARK included a tour of the new Medea 1905 Lifestyle Collection and a chill friends-and-family round-table dinner. Our Steelyard attendees had fun hanging with Jeremy and Jason from Bauer/ Clifton, Morgan and Paul from Edward Shae, and the dapper David Santiago among others. A prime place to people-watch, the TA dining room reads like the Who’s Who of design! FROM HOLLYWOOD TO HIGHPOINT unfolded in a glam section of the French Heritage showroom with interiors and product designer Michelle Workman, (dressed in vintage Jack Bryan) describing the creative process behind the swanky FACET collection. Likening it to childbirth, hard labor was indeed required. A lively Q&A --great questions, you guys!--and fab tagine lunch followed. Yaron Linett of Formal Traditional (Seated second from the right, left photo), had this to say: "Hollywood To High Point at French Heritage was fantastic. Michelle Workman's collection with French Heritage is exactly what our upcoming Art Deco restaurant pitch needed. There is no substitute for seeing something first hand and speaking with the creators." On Sunday at 6 PM, Oly was the place to be for Veranda Magazine’s 30th Anniversary Party where Editor-in-Chief Clint Smith warmly greeted each guest upon arrival. It was quite a thrill to celebrate alongside the Toms, (Pheasant and O’Brien), Mary McDonald, Melanie Turner, Ishka Designs, Cloth & Kind, Lisa Sherry, Joseph Aldrich, James Swan...the A-list goes on! SO much talent in one space. THE DATA BEHIND THE DESIGN illuminated the relationship between consumer behavior and product design. 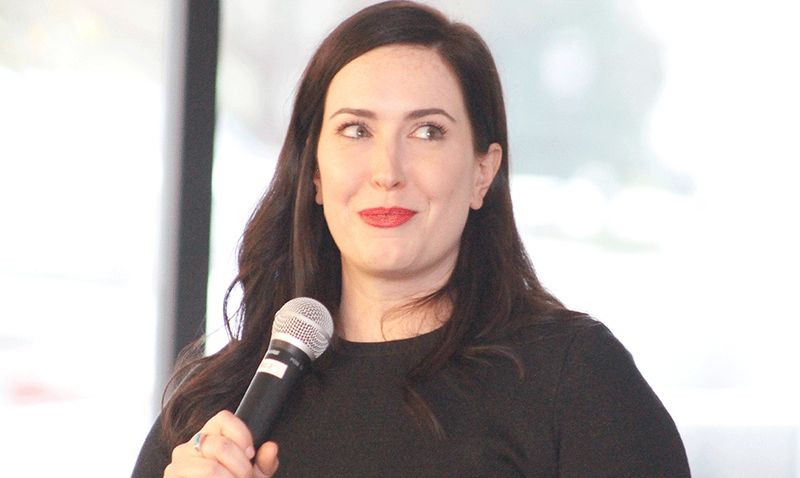 Led by the always engaging Kelli Ellis and astute culture-spy Jaye Anna Mize, we saw how tech is driving a desire for calm, comfy, and tactile, and how a resurgence of feminism is influencing the curvilinear form and fleshier palettes. Kelli also let us peek at the collection she’s debuting with Sunpan in April. Woo hoo! SUDS, RUGS & SHUFFLEBOARD was on Monday’s happy hour agenda at Chandra where our crew's beer-tasting skills and puck-sliding prowess were put to the test. With the Tiwari brothers (Shashi and Ravi) leading the fun and games, our thirsty and competitive group sipped Georgia brews like Second Self, Creature Comforts, and Scofflaw, and played tag-team shuffleboard. MIMOSA MORNING was all about Scarborough House’s Di-Ann Williams being the hostess with the mostest at Tuesday’s "Sip & Stroll", where we saw how each piece of fine wood furniture is deftly crafted, carved, and veneered. And how cabinet lights magically turn on and off at the tap of a hinge. (Apparently there's actual Science behind it but we're not convinced...) The classic patina of antique reproductions lent credence to our Market mantra that “Brown is Beautiful” and verified that Steelyard’s special limited edition “Heritage” nail polish was the perfect choice for Fall. We have so much more to report and unpack from this Market and can't wait to share it with you in the weeks ahead!